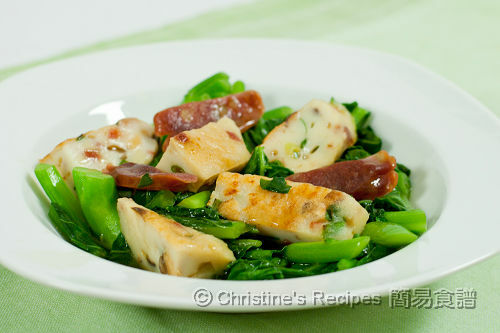 This dish is an alternative way of cooking Gai Lan (Chinese broccoli) traditionally, very tasty, full of flavours, that the vegetable turns out to be the most enjoyable part, as it absorbs the oil of lap cheong and natural sweetness of fish. Best served hot with steamed rice. Chinese broccoli (aka, Gai lan) is widely used in Chinese cuisine, especially Cantonese dishes. Its name in Chinese, (芥蘭 Gai lan) literally means "mustard orchid", and belongs to the same plant family as broccoli and kale. It's high in beta-carotene, and contains folate, vitamin E, iron and calcium. The most popular way of cooking gai lan is stir-fried with ginger or garlic, or just boiled with water, then served with oyster sauce. Their thick stems are edible, but take longer time to be cooked as compared with their dark green leaves. Sometimes, you might find it’s got a bit bitter in taste. My mum used to add a hint of sugar to balance their mild bitterness and bring out the best of this lovely vegetable. If you’re fed up with the usual way of blanching gai lan or stir-fried it with garlic, here’s my mum’s favourite cooking way. She liked to stir fry it with fish cake or/and Lap Cheong (臘腸 Chinese sausage). 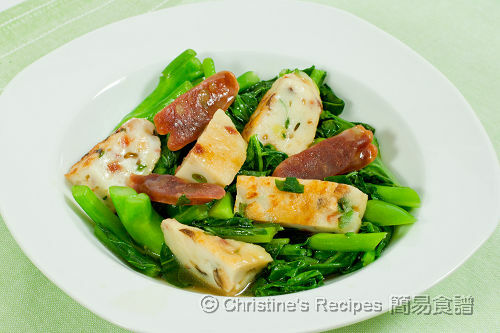 This stir-fried Gai Lan dish is tasty, full of flavours, that the gai lan turns out to be the most enjoyable part, as it absorbs the oil of lap cheong and natural sweetness of fish. My kid likes this vegetable the most when it’s cooked in this way. Rinse and wipe dry gai lan. Cut into 1½ to 2 inches long sections. Separate stems and leaves. Set aside. Blanch lap cheong in boiling water and remove grease and impurities outside if any. Cut into two halves. Dice one half and slice another half. Chunk fish meat and place into a food processor. Pulse until smooth. Transfer into a large bowl. Add shiitake mushrooms, diced lap cheong, scallion and marinade. Use chopsticks to blend towards only one direction, either clockwise or anti-clockwise until elastic, about 10 to 15 minutes. Heat oil in a frying pan. Place fish paste and lightly press to flatten. Cook over medium-low heat until both sides are golden brown. Remove from pan, let cool a bit. Cut into smaller pieces. Set aside. Add oil in the pan, sauté ginger until fragrant. Toss in the stems of gai lan. Increase heat, and stir fry until they soften. Add leaves, quickly stir fry. Sprinkle wine, pour in chicken stock. Season with salt and sugar. Toss back fish cake and lap cheong slices. Add thickening, cook to preferred consistency. Served hot with steamed rice. very nice dish Christine! I am growing gai lan! Love the vegs! You made your own fish cake. I have been wanting to do that for a long time! Thank you for sharing! I have tried your bak choy with fish cake that you put dried shrimp into the fish meat. Even my hubby doesn't like fish love it. This is another yummy recipe that I should try. Thanks for sharing. Had just came across ur hokkiado milky loaf and couldn't wait to try. Can I bake it without the help of bread machine? May I know what brand of bread machine are u using as I m thinking of getting one. My fans made the hokkiado milky loaf by hand, but I often use bread machine by saving me much effort and time. Mine is Sunbeam. I actually enjoy munching the gai lan stems! hi, thank you for your reply. do you know whether can i buy sunbeam bread machine in singapore? Sorry, I have no idea of where you can get a sunbean bread maker in Singapore as I'm living in Australia. Are there any electrical stores near your place? This looks yummy! I remember loving lap cheung when I was very young but my bf hates it haha says sausage shouldn't be sweet. christine.. would it be okay if i make the fish paste one day in advanced and put it in the fridge? is it gonna change the taste or texture of the fish cake? Yes, I often make and pan fry the fish paste ahead and keep in fridge. Then stir fry them with vegetables when I need them. For those with allergy to mackerel, is there any other fish that will work for fish cake? excellent dish, I love it, I made it first time last year when I brought home lap cheung from HK (from wing wah). Congrats on your success! Thanks for letting me know.